Suspected kidnap kingpin Chukwudemeje George Onwuamadike alias Evans still have guts to be looking for special treatment, nah wah!..,I wonder where his wife, kids and mother are, they should join him at the cell....abi weytin una think? According to the Nation, the kingpin, who was arrested on Saturday at his 3, Fred Shoboyede Street, Magodo, Lagos home, is being kept in a maximum security cell. 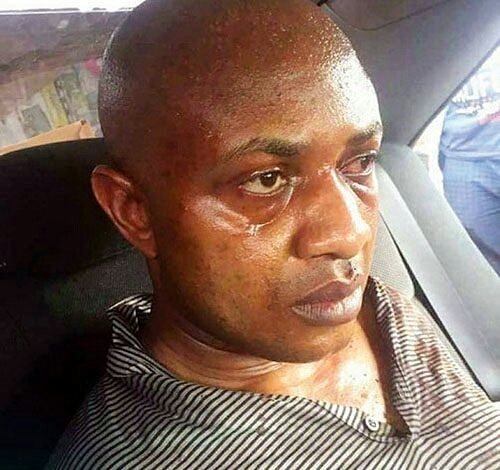 It was gathered that Evans broke down yesterday, lamenting the state of the police cell. A source said he lamented that after making billions, owning gold, diamond and living like a king, he finally ended up in a cell with poor suspects. It was gathered that he told his interrogators he has two other detention camps in Lagos. He was also said to have confessed that he started off as an armed robber in Sokoto State. The source said: “He has been weeping uncontrollably because he is in a cell with common poor criminals despite all the wealth and mansions he owned. He has started talking. He has given us locations of other detention camps he had in Lagos. Aside Igando, he had two others and detectives would visit the place. He also said that his very first robbery was in Sokoto State and that they killed the victim. He is still being interrogated and more details would come out after the camps have been visited.” . Meanwhile, The Nation learnt yesterday that Evans has been excommunicated from Nnewi for over five years because of the terror he unleashed on wealthy indigenes of the town. . It was also learnt that his second in command, Felix Chinemerem, a native of Amanagu in Abia State, was also declared wanted in 2014, after his criminal activities led to the killing of many innocent people. . It was learnt that Chinemerem took part in the kidnap of a prominent Nigerian, which prompted policemen to storm the community and allegedly shot randomly, killing villagers. After the incident, the villagers were said to have moved to kill him but he fled and had not been seen since then. 0 Comment to "Billionaire kidnapper Evans cries uncontrollably as he is placed in cell with 'common poor criminals''"